I think the above says it all. In any other country, the leader of the losing party would always start by conceding defeat and congratulating the opponent on his victory. If the said leader is the head of government, he would also say something like “I look forward to working with so-and-so on our national issues”. And if an election has been particularly divisive, there would be words like “We should heal the rift between us to work on the issues that matter to voters on both sides of the electoral divide”, etc. Instead, we have a PM who starts by (again) blasting the other party for prompting a by-election, spends more than half his statement praising his own candidate and justifying his party’s loss, then adds a sentence to “also” congratulate the winner, but demands that he “contributes” to Parliament. Instead of saying he looks forward to working with the WP on the important long-term national issues that he trumpets at the end of his statement, he demands Mr Png’s contributions first! He then slips in another defiant statement that he will win back Hougang eventually. Mr Lee– with this attitude, you may see nuclear energy in Singapore in your lifetime, but you will never win back Hougang in your lifetime. PS DPM Teo was just as bad– in claiming that Hougang voters are “special” and “not representative of Singapore generally”. I guess “retarded” was too strong a word, even for him. This entry was posted in OTP Series, Politics. Bookmark the permalink. This is what deepend the affective divide for this arrogrant and elitist party. We shall see the consequences in the next national poll. Yes, WP has won the MP seat to the parliament. But WP lost 2% votes. Therefore LTK, plesaw review your WP organization especially on command and control. Another few saga, you will lose more share in the next coming election. The 2.7% of votes won by the PAP is equivqlent to just about 156 votes. The extra few hundrd votes afte one year of so call look into the needs of singaporeans, is it really working and significant? You can answer yourself. Do not cover upa defeat with self serving reasons. It gets you no where and no improvement will ever be made by them. i think we should let Mr LTK take AY’s comment as constructive criticism and reflect on how the part can improve. The road ahead is a treacherous one.. there are many ways to slip and WP cannot afford to feed the main stream media opportunities to erode public confidence. If you read some of the articles published before voting, you find they are subtly doing that.. the tactics are just going to get more subtle from now on. it’s 2% obviously because the boundaries were cut! if they didn’t cut, it will probably be like 0. something%. oh come on. after all the drama, it’s still 60+%. it shows that people are looking beyond the mainstream media. and i have lived in hougang for 19years, it feels GREAT to be taken care by WP. now i’m not in hougang anymore, the home feeling is not anywhere to be found, even in the very well developed areas, there’s nothing like HOME. also, desmond choo has been serving hougang because he’s an advisor with the PA for hougang. he’s PAID to do projects for hougang. so do not be fooled people. w/o pay, any normal being would’ve DISAPPEARED. desmond choo seems q a gentleman and a whole. the only thing is the colour he wears, and the people who ‘spoke up’ for him. Well, DPM Teo is not representative of Singapore either. I am appalled when he said to the effect “Not happy, sue me lor” when asked about character assassination. Clearly shows his arrogance. This is the same man who claims ISA still has its use today, but will not give a fair trial to the past victims. He has finally come out of his shell in recent years; hid long enough behind the scene as the “quiet , good guy” for too long. I’ve always suspected he is the still water that runs deep. Recent events have proven that. Frankly when I saw his post-defeat interview on CNA’s website I cringed and when it got to the part where he challenged WP’s to sue him – I was disgusted. So condescending, so arrogant and so low. I think DPM Teo has set the stage for a PAP vs WP at Bishan-Toa Payoh GRC in the next GE. SPP should focus on winning back Potong Pasir SMC and allow the WP to contest Bishan-Toa Payoh GRC in the next GE. WP should form an A Team to contest Bishan-Toa Payoh GRC. This will make my wet dreams come true!! I live there, and welcome a stronger party. hey Desmond Lim will say: Hello, this is my territory, please leave me alone ok? SPP should contest in BOTH Bishan-Toa Payoh GRC and also Potong Pasir…..in 2016…I beleive that PP might also absorbed there…. WP should contest Pasir Ris-Punggol then,NOT SDA!!!! SDP should contest Tanjong Pagar…. NSP should contest Marine Parade…. AMK might go to either NSP or SDP…..
WP should conquest all the East except Marine Parade…. And Reform should continue on the West side,even Western coast even Clementi and also Telok Blangah,Radin Mas and Pioneer also not forgetting Hong Kah and Jurong West….ALL except the Jurong side for the SDP and also Jurong East…. The fear based rule is OUT.Love reigns.Care for us and we will reciprocate. The contest in Hougang was about national issues. Tried as much as they did, they focused on estate issues instead. But they had no choice. IT is representative of the entire nations feelings and they know it. But they cannot admit it for obvious reasons… ego, face and a brand that is no longer relevant to voters below the age of 40. I am not sure if they attended politics 101.Maintaining arrogance is good. It assures votes will swing away from them. Hougang could proclaim May 26 as “Constituency Day” and encourage people to celebrate its meaning: “Your vote is powerful!” People from other GRC etc could drop by and join the festivities.. perhaps then, the representation is decisively clearer to some. Actually, HG should give conduct masterclass to any Singaporeans who wish to know how to overcome their fear, and truly walk the democracy road. Any money collected will go towards their upgrading pocket funds. point 4. of pinky loong’s statement: ‘a by election always puts the ruling party at a disadvantage’. Looks like these PAP baskets still haven’t learnt their lesson. Just imagine the stature of our DPM saying words to the effect “Sue me if you want to pursue further”. Very elitist & completely no standard. Only makes our PM sound so fake and insincere in openly declaring the slogan “Towards an inclusive society”, in the same class of those who uttered those infamous words “Get out of my uncaring face”. Why our PAP leaders nowadays can’t seem to match even halve the calibre & charisma of those like Goh Keng Swee & Ong Teng Cheong ? Those with charisma and calibre are joining other parties. Actually, I think they pretty much twisted the statement. Ok, first he explains why he called the by-election. He doesn’t say that it’s good or bad, just that it happened cos the seat is vacant due to the expulsion of the WP MP. Probably not necessary, but hardly a verbal diatribe. Next, he says the PAP candidate worked hard, did his best, and got more votes than before, reflecting more support from residents as compared to the last time. Seems pretty legit to me. He says he offered commiserations to the PAP candidate, had faith in him, and thanks those who voted for his party. Makes sense to say that he is disappointed not to win, and to thank those who voted for him. What’d you expect, for him to say he’s happy the PAP lost and to thank those who voted against them? Then he says congratulations to the WP candidate on his victory. I don’t see why this needs to be expanded. The WP will surely explain how their candidate did a lot of good things to win. It’s a little weird to expect the leader of the losing party to detail the contributions of their opponents. The congratulations seems sufficient. He doesn’t ‘demand’ the contributions- he looks forward to them, which means he trusts the WP candidate to make contributions in Parliament. I don’t see why saying that you’re looking forward to good things from someone is tantamount to saying that they’re lousy- it’s actually saying that they’re capable. There’s nothing wrong with saying you respect the voters’ choice, but are confident in gaining their support for the next election. It’s basically the same as saying ‘We accept we lost this time, we will do better and I have confidence in our candidate to be successful in the future.’ Hardly the sort of disrespect to voters that would warrant an outcry. He talks about what he believes to be important. Immigration, transport, population, income, e.t.c- nothing wrong with that. Then he says that WP and PAP must work together for the good of the nation, now that they are no longer competing in the by-election. This isn’t inconclusive, this is doing exactly what the article wants- saying that they will work together, with contributions from both sides. Really, I suspect there is more vitriol in this article than in the PM’s statement. PAP still think that they are Government of Singapore and Government of Singapore comprises of only PAP. This statement coming from him as Prime Minister of Singapore should have not sided with PAP nor treats WP as outsider, unless he speaks as capacity of Secretary-General of PAP. Very true. The PM is short-sighted. He is not the PM of Singapore, he is only the PM of the PAP. He should enjoy it while it lasts. This is weird….he is from the PAP, I don’t see why he should be neutral? Can you name me any democratic country where the president/prime minister is actually completely impartial? He is the PM of Singapore, and also a PM from the PAP. I don’t see why these two roles should be completely held apart. He favours the PAP’s interests. It would be incredibly stupid for any political party to be favouring another party. About the by-election favouring the opposition, though, I must admit is completely unfounded. A faux-pas on the PM’s side. Do you mind interpreting “and also because a by-election often puts the ruling party at a disadvantage”?? What is the basis of that statement? What do the results of 1992 by-election held by Goh Chok Tong show then? Vitrol? Maybe you should read the PM statement again – or are you referring to that statement (maybe he needs to change his press secretary – oops I forgot his wife is one of his talented MPs). Key phrases: Offering a “fresh start”? a “break” ? By-election puts the ruling party at a “disadvantage”? what kind of “fresh start”, “break”, or “disadvantage is he referring to in a democratic process – or what is wrong with WP expelling YSL in their circumstances? It seems you write this behind false pretenses of neutrality. I think DPM Teo has set the stage for a PAP vs WP contest at his ward of Pasir Ris-Punggol GRC in the next GE. SDA should let WP to contest Pasir Ris-Punggol GRC in the next GE. WP should form an A Team to contest in Parsir Ris-Punggol GRC. I agree with dunbelievethis. Give credit where credit is due, the PM’s statement is mostly neutral with just a hint of partiality to the PAP. After all, he is a PAP man, what do you expect. Just because you dont agree with alot of what they do does not make them pure, unadulterated evil monsters who can never say or do anything right. And teo chee hean was merely being what he is, a politician. Im not defending him, but if you play the game you got to take the blows. “mostly neutral with just a hint of partiality” – read our replies above. “pure, unadulterated evil monster” erm, I think most of the posters here don’t go to that extreme. “who can never say or do anything right” – and if everyone is doing everything wrong what kind of world are we living eh? Twisted logic. Do remember PAP sympathizers, that the 2% was a mere more 135 more voters than last year’s election. That’s like less than half a HDB block. 1. This by-election in the Hougang constituency was called as the seat has been left vacant for some time. I congratulate Mr Png E. H. and WP for winning and look forward to his contribution. 2. Desmond was PAPs candidate in this by election. We believe he was a good choice since he contested Hougang in last May’s GE. Despite receiving a minority vote, he has continued his best efforts in Hougang over the past year. 3. The purpose of this by-election was to allow voters to choose their candidate which they felt would best represent them in parliament and look after Hougang. Desmond from the PAP provided an alternative voice to WP. Desmond promised to do his best and work with the residents to help Hougang improve together. 4. Desmond and his team put up a strong fight, but the relationship Hougang has built with WP over the past 21 years has been a challenge. So WP has had the advantage in this by-election. 5 & 6 & 8. I am encouraged that Desmond garnered an increase in votes compared to the previous GE elections in 2006 (37.3%) and (35.2%). We are thankful to each individual who voted for Desmond and PAP who believed in Desmond’s sincerity, compassion and commitment and shared our (PAP’s) vision for change and hope. Although we did not have enough votes to win, we hope that you will continue to support him in future. 7. I have spoken to Desmond and his team, thanked him and his team for their hard work and commended them for fighting a good fight. Although disappointed by the results, he is in good heart and keen to continue serving in Hougang, contributing in any role he can. 9 &10. The Hougang constituents have voted and once again, I congratulate WP and Mr P E. H. for winning this by-election. I respect the voters choice and look forward to Mr Png’s contributions in Parliament. For those who share our disappointment that Desmond did not win, be assured that PAP will continue to be present in Hougang and I am confident that we will put forward our best effort in future elections. 11. At the national level, we have set a new direction. Since the elections last May, we (PAP) have done our best to address important national issues like housing, transportation, immigration, population, economic upgrading and worker’s incomes. We have made progress but there is still much more that can be done. 12. With the conclusion of the Hougang by-election, we can finally focus on these longer term-issues. We hope that Mr Png will work with us as one people to achieve the best for Singapore. Thanks. But the content is wrong to start with. Is the above para anecdotal or factual? It is simply a matter of good PR sense. No PR person worth their salt would have written a statement like the above. Seriously. See how other 1st world leaders concede defeat here. This article seems to be bordering on sensationalism. I agree with dunbelievethis. 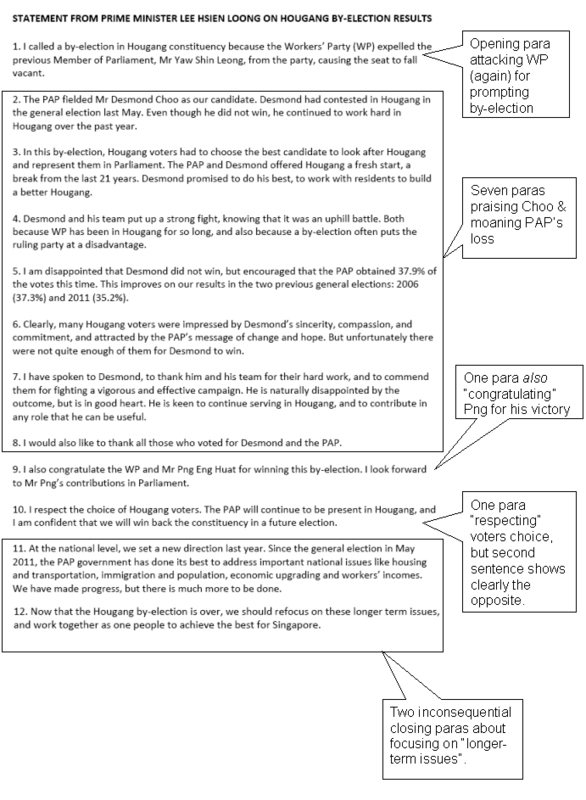 I live in Hougang and am not a PAP supporter – but his statement is pretty much a neutral one. Of course he would be ‘moaning PAP’s loss’. He’s their Secretary-General, for goodness’ sake. Let’s be rational and reasonable critics, not people who nitpick at every statement issued by the ruling party. One does not moan a party’s loss in an official government statement bearing a letterhead that carries the coat of arms of the Republic of Singapore. He should do that in a letter with a PAP letterhead if he wishes. The first statement PM Lee should have done is to congratulate Png on his victory and to welcome the newly elected MP for Hougang and say that the Govt looks forward to working with him, and with the workers party, to deal with the critical issues which face the nation. That he did not see fit to do so shows he’s wearing the wrong hat when issuing the statement. Indeed, most people can no longer separate the govt from the pap, and here we have evidence that even the pm himself can’t or won’t separate the two. I truly agree. I believe his statement is fair and acceptable in his capacity as a SecGen of PAP. But he did that in his capacity as the Prime Minister of Singapore. Which is the very reason why he is losing respect with some. You wear too many hats, you tend to wear the wrong hat at the wrong time and say the right things. Just my 2 cents. Looks like he’s forgotten how he apologized to the people of Singapore. Get down on your knees LHL. If not when the people of Singapore are done, you will indeed be humbled. politicalwritings’ views are decidedly unbalanced and irrational.In this instance, as in many others, he/she flavoured the commentary with the spikiness and slant accruing from his distinct dislike of the MIW. My opinion after reading PM Lee’s statement dovetailed with yours. “Just because you dont agree with alot of what they do does not make them pure, unadulterated evil monsters who can never say or do anything right.” – so politicalwritings has some of the time penned down something right eh? :). Wake up. He is a $2m (+ bonuses) man. He needs to do better than most people. The PM and his cabinet of ministers aka ‘ the Government’ is formed from a group of ELECTED MPs belonging to the party with the majority in parliament. The PM did not go for an interview to join the Civil Service or whatnot. His statement in his capacity as PM is as a elected member of the PAP hence you cannot expect the same total impartiality as you would from say, someone heading a department in a ministry. The PM is a politician, not a civil servant. Let’s keep that distinction in mind. Is that what you really think the head of your govt should say when he loses a seat? Is that the magnanimity and graciousness you expect from a world leader? Precisely, as THE PRIME MINISTER OF SINGAPORE, representing SINGAPORE, it does not look good on him siding a party even though PAP forms the majority and he is Secretary-General, if he wants people to respect him, especially, SINGAPOREAN. I think no one in the world will have trouble understanding that the PM is a member of PAP. Just as President Obama is a Democrat who will not restrain himself from promoting the liberal views of his party. I don’t know why we have so much trouble accepting that the government is a PAP government. The PM and his ministers do not need to hide this fact and pretend to be impartial in their statements. Opposition parties are their rivals. Them being fair to all Singaporeans regardless of their political leanings is just a feature of good governance to ensure they can get re-elected. If they are are perceived to be unfair in word and deed to particular segments of Singapore society then they will pay for it at the ballot box. Simple as that. Which statement do you think will bring greater dignity to the office of the Prime Minister, and indeed, to the PAP as a whole? My one para above, or the statement as issued by the PM on 26 May? Looks like it’s you who really needs the wake-up call. You quoted “Dontbesorewinners” while I referred to “dunbelievethis,” Shooting from the hips eh? Lol. Heh, my mistake. why now, using that quote is not relevant eh? I think I’ve answered your question of your biased insult to politicalwriting with fair comment – but wrong quote, and you reply back with a flippant “shooting from the hips” Nice comeback kid. I find it so funny that the writer does the exact thing he rails and rants angrily against; flippantly dismissing comments, insulting the commentors, trying to wrangle the discussion because it does not fit with the tone he would like. Like a true blue government man. Come on dude, a balanced, rational tone does much more to help your cause. Being angry, bitter and cynical only paints opposition voices as irrational people unfit to comment on national issues. “Being angry, bitter and cynical only paints opposition voices as irrational people unfit to comment on national issues.” Wow. Angry – no. Bitter – no. Cynical – well, maybe if you don’t see it as ‘criticism’. Irrational – mmmm, more ‘no’. “he rails and rants angrily against” Just as how you’re railing & ranting with this reply? :). If you’re not then what is the question you’re asking. “insulting the commentors” – erm, like how you’re asserting “angry, bitter & cynical” ? Hahaha just listen to yourself. Exactly what im talking about. @ Dontbesorewinners – is this your way of “arguing” a point? Read Michele Christian’s exemplary post below on how to use fair comment. Now that I know what to expect from you, this shall be my last post to you – because it is obvious that you are simply incorrigible and a political troll, I’ll still sleep well every night. I’m secretly pleased that incompetent juveniles like yourself is rooting/working for the incumbent, as it only benefits the rest of the competition :). Good luck to your future endeavors..
For so many years, Singapore was a one party governemnt, but it is NOT anymore now. Hmm I stand corrected but I also cant seem to find anything on Sec-Gen WP thanking Desmond Choo or PAP? I am also not sure if any political party can treat other parties as non-rivals when parties attack each other during rallies to advance their own agenda. I do find it hypocritical though when Mr Low spoke abt character assasination. When WP attack Desmond Choo by stating his uncle was previously arrested, they deem that as not an attempt at character assasination. But when Teo Chee Hean said Png Eng Huat was not the best man cause he was not chosen as the NCMP, he was said to be character assasinating. To me, its one and the same thing. Its not wrong, its just the nature of politics. We say that PM is not supposed to say anything biased cause he is head of the government and we want an inclusive Singapore that is not polarised. But what did this article just do? Come’on people. Lets move on. @ Trying to be objective…. Wendy– Singapore is not a coalition govt, is it? So we still have a one-party govt, will have for quite some time yet. I think what you mean is that we are no longer a one-party Parliament– but that has been true since 1981, when JBJ won the seat of Anson. I get your point, but you should be clear on the difference too. After a loss, you would settle down and review your shortcomings and examine areas of improvements. Unless you give up altogether you would seeking improvments, train harder and make good to win back the race. Quietly adding 0.3% to that 2.7% does not even give self consolation if that was deemed sufficient to qualify for one year’s efforts to be kinder. The look, reaction, and subsequent words of someone who could be the next PM say it clearly. The men-in-white have lost their marbles. Those who still think that none others (political party) can manage Singapore of today’s standing should stat to weigh the merits of staying or migration. Congratulations, Ah Huat, for your win. I have this advice for you. Do not let this (win) get to your head and listen to what many people are saying. “You can put a monkey at HG (against PAP) and still win”. It may be somewhat overstated but remember the old days when it was “PAP can send in a donkey and still get a WO”. Do not talk so fast, keep your brain in front of your tongue. And I may add, seriously you need to learn public speaking (asap). I can help you (FOC) if you are humble to accept it. The ‘nuclear energy’ portion made me laugh my socks off. So true and humorously put forward by writter. I’m certainly coming back for more. I think what this article has done is to point out rightly what should/ should not be included in a statement issued by a head of govt. I was curious to see what 1st world leaders would write and I found this – http://www.pm.gov.au/press-office/queensland-election-result, the statement issued by PM Julia Gillard when her Labour colleague Anna Bligh lost the premiership of Queensland to the opposition. PM Gillard too is a politician (as someone pointed out is PM Lee 🙂 ) and she does use the statement to remind Australians of the accomplishments of the Labour Party in QLD. However, she and her PR team know that it is accepted good manners and good grace to start by congratulating your opponent rather than subtly putting them down as PM Lee has done (para. 1, is there a need to remind us of it all? It makes you look petty and small, PM). PM Gillard does not express disappointment that Labour lost or that she thinks they can win back the state, because she understands that that would be INAPPROPRIATE and frankly unprofessional to mention in her capacity as the Prime Minister of all Australians. Does PM Lee show that same understanding? Lamenting PAP’s loss and its disadvantage (para. 4 & 5) and talking about winning it back in future (para. 10) belongs in a statement to PAP supporters in his capacity as SecGen of PAP, not in his unifying role as PM of ALL Singaporeans. The fact that he and some others who have commented here do not know the difference is worrying and does not speak well of developing a more mature way of political engagement or even simple graciousness. That from a party that is trying to build a more gracious society but cannot lead by example. You just have to laugh at the sad irony of it all. Their core values are those of bullying, intimidation and repression. So their reaction is unsurprising. Interesting! However, by substituting all references to “PAP” with “WP” and vice versa, and substituting “Hougang” with “Singapore”, it will then truly reflect the real sentiments of the people of Singapore. I’ll suggest the opposition parties keep a copy of this statement as a template for use in 3 years’ time. Sama sama lah. LTK also smeared and smeared instead of thanking HG residents first. Reblogged this on Csmechtler's Blog.